In the summer of 2018, Quill announced the re-launch of its legal cashier training academy. Quill has taken over twelve months to plan and implement the new academy which has included a review of all course content, recruitment of specialist trainers, and investment in systems and accredited qualifications to both ILFM and AAT. The academy equips trainees with the skills and experience to succeed in their chosen career as legal cashiers in a supportive, nurturing environment whilst earning a living wage. Abigail Morton and Ross Carvell have officially begun their apprenticeship which commences with an initial intensive twelve week training course. Thereafter, the training will continue for eighteen months and encompass the funded ILFM diploma qualification and ILFM membership as well as AAT qualifications. The training is taking place in a purpose-built training suite at Quill’s Manchester head office and is delivered by its internal training team which effectively sits at the helm of Quill’s training academy with responsibility for growing the next generation of cashiers. The management board at Quill is closely following Ross and Abigail’s journey through its new training academy as they continue learning in earnest about all aspects of general bookkeeping before progressing onto the complexities of solicitors’ accounts, defined by the SRA Accounts Rules and CLC Accounts Code, including anti-money laundering and GDPR obligations. Quill’s cashiers predominantly use its own legal accounts system, Interactive, however there’s also a dedicated team providing cashiering services on other legal software to cater for market demand. 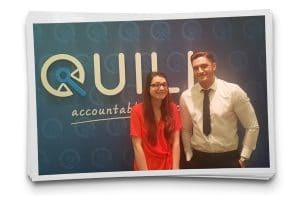 Regardless of software choice, the two trainees are now learning every aspect of accounting rules pertinent to law firms, discovering how to keep service users regulatory compliant and finding out how to provide meaningful support to clients on getting the most out of Quill’s Pinpoint cashiering service. Ross and Abigail have been enrolled with the ILFM to undertake their diploma studies, mastering double entry bookkeeping and gaining comprehensive knowledge of accounting rules. Being studied alongside ongoing classroom- and application-based instruction at Quill, the two trainees will constantly reinforce every aspect of cashiering to become fully qualified legal cashiers. Tom Wormald, Quill’s Client Services Director responsible for client-facing services, states: “We’ve put a lot of hard work and effort into our training academy, getting the right people and systems in place to ensure Ross and Abigail are in capable, experienced hands. At Quill, we believe in investing in individuals to succeed. I was heartened to receive over 700 applications for our trainee scheme this year. This unprecedented volume demonstrates how our apprenticeship programme is held in such high esteem.